We warmly invite you to worship with us. We hope to create a relaxed atmosphere at all our services. There is a range of styles, from the very informal to the more formal and a wide variety of music is used to express our worship. Whatever the style, there is always a strong emphasis on learning from the Bible. Facilities and resources include toilets with baby changing mats, a staffed creche, a hearing loop, large print materials, wheelchair access, disabled parking. 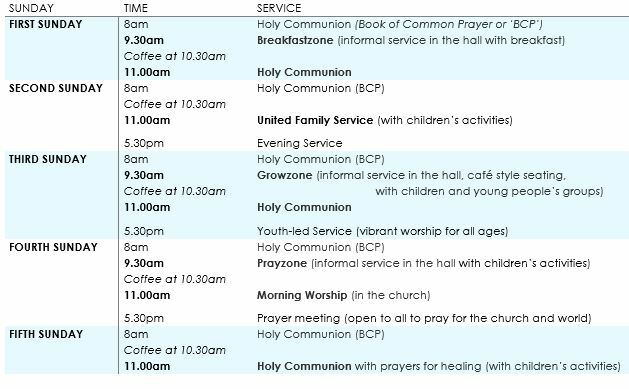 If there is anything you need, please speak to one of our Welcoming Team Members or Churchwardens. For more information about any of our services, please click on the tabs to the left. The church is open each weekday morning from 10 – 12.30pm or at other times on request from the Church Centre office.